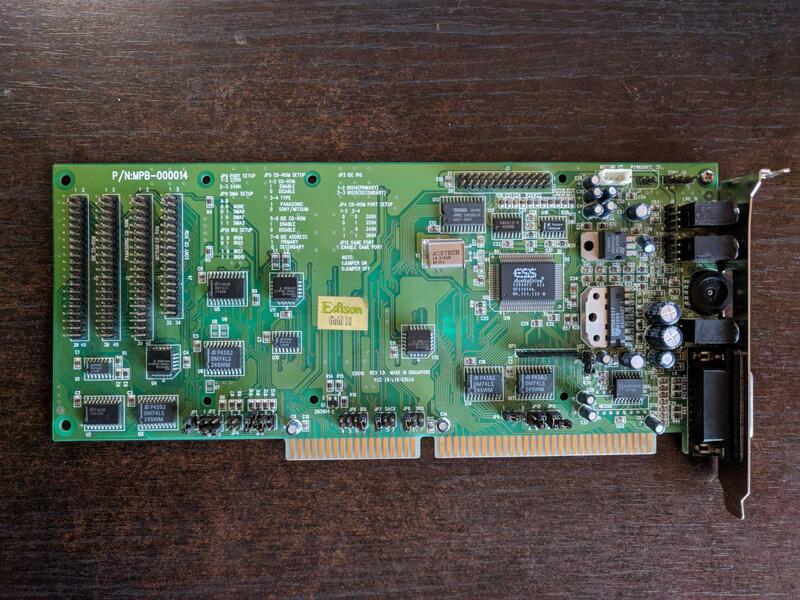 I have this ESS Edison Gold 16 sound card and it has an IDE interface on it and I'd like to connect a CDROM drive to it. It has support for Panasonic, Mitsumi and Sony drives. I have a Sony drive but not with the 34 pin interface as on this card, just a normal 40 pin IDE version. I also have a Philips drive. Both my Sony and Philips drives are from around 2003 to 2007-ish, so they're quite new as I'm trying to get CDROM working on my 286. My multi-IO controller has the standard IDE, Floppy, COM ports etc. It's of a no-name Chinese brand. I've been using it for a while and it seems to work just fine. It has a bunch of jumpers on that I haven't touched since I got it. There might be a conflict with this card but I can't tell for sure. I did try another multi-IO card and I have the same results. So, I'm basically like to do a bit of a sanity check to get the IDE on the ESS card to work for my CDROM drive. There is quite some information printed on the card itself (see picture) which I think is great. I'm going for the "IDE CD-ROM" set up since I don't have any of the proprietary drives. JP1: Don't know what its for. JP2: Don't know what its for. JP5: (difficult to see in the picture but its the 8 pin layout to the right of JP4). The top row is pin: 1,3,5,7 the bottom row is pin 2,4,6,8.
pin 1-2 enabled (i.e. enable CD-ROM). pin 3-4 disabled (can't seem to select a non-brand). pin 5-6 enabled (i.e. IDE CD-ROM). pin 7-8 disabled (i.e. use as secondary IDE). JP3: (difficult to spot in the picture but JP2 is a 3 pin horizontal row, JP3 sits underneath that). pin 2-3 enabled (IRQ15, secondary IDE). JP12: disabled (no game port). No drives found, aborting install. I'd love to find the manual for this card and figure out what JP1 & JP2 are for but any insight and/or ideas on what I might be doing wrong would be much appreciated. Last edited by pan069 on 2019-4-14 @ 06:58, edited 1 time in total. Hmm. I thought, maybe JP5 pins 1-2 and 3-4 are a combo, as in, 1-2 select to enable one of the proprietary drives and then pin 3-4 select which one leaving pins 5-6 to enable IDE. So, you'd either enable 1-2 or 5-6 but not both. I have tried 3 different multi-IO cards by now. I don't think there is a conflict. My CDROM drive is set to Master (as in secondary master IDE). I'm loading the OAK CDROM driver in my config.sys. I have used this driver over many years and a variety of systems and drives, always worked fine (this is my first time using it on a 286 though). Thanks for that. Unfortunately I tried those drivers and they are for Windows (3.1x) only and the bits of DOS that's in there is for PnP configuration of the sound card, probably a later version of the card than I have. There are some other ESS drivers on Vogondrivers but none seem to apply (PnP) or work and/or include a CDROM driver. Through some googling I came across this thread. Fortunately I also have a SB32 (CT3600). I will give that a go over the next few days. What's wrong with adding it as slave to your existing IO card? Unless you have two devices on it already, or it doesn't support ATAPI of course. 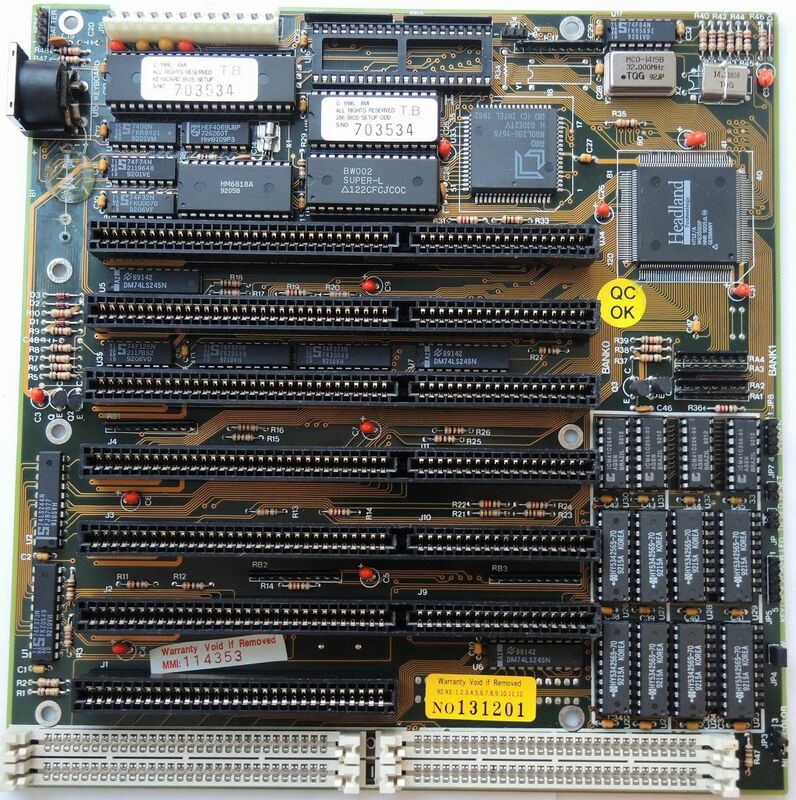 I have successfully used (a different revision of) this card's IDE controller with nothing but normal ATAPI DOS drivers in the past. ES688 requires nothing special. Make sure you have no other secondary IDE controllers working in the system. konc wrote: What's wrong with adding it as slave to your existing IO card? Unless you have two devices on it already, or it doesn't support ATAPI of course. I second this, if it is possible. I had a 286 PC that had an IDE hard disk, and even with the very primitive IDE controller it had on it, it could still access the CD-ROM drive with the appropriate DOS drivers. I've found onboard IDE to be very temperamental on ISA sound cards in the past. It's 300h default actually and it is possible that this port conflicts with something else in the system. I would try each of the other options (310h, 320h, 330h) to see if it does anything. EDIT: also, have you tried jumpering away any and all IDE functionality from the multi I/O card, setting the sound card to primary IDE, and booting from a floppy? Just to make absolutely sure there is no conflict going on? I have no information on JP6, JP7 and JP8. The sound (digital/FM) seems to work fine so its not conflicting with that. JP3, IDE IRQ, is set to IRQ15 (Secondary), see also JP5 pin 7-8 (disabled, i.e. secondary). If JP3 is the IDE IRQ and JP10 is the sound IRQ, what IRQ would JP6 be for then? pan069 wrote: If JP3 is the IDE IRQ and JP10 is the sound IRQ, what IRQ would JP6 be for then? Possibly IRQ for the Sony/Mitsumi/Panasonic interface, since the IDE CD-ROM jumpers are explicitely for IDE only. I can't see the picture of the card anymore, but I am certain the silk screen actually said JP6 is IRQ (for IDE) and JP7 and JP8 are DACK and DRQ (for IDE) respectively. @appiah4 Thanks for the info, much appreciated. I've checked JP6, JP7 and JP8 and they are set exactly to your cards settings, JP6 = IRQ11, JP7 = DACK 3 and JP8 DRQ 3. However, the silk screen also states: JP3 IDE IRQ when selecting pin 2-3 its set to IRQ15 (Secondary), which I have. What's the correlation between JP3 and JP6. Does the IDE and the CDROM each need their own IRQ? Iv'e also changed the port to 320h. I can't seem to figure out (or see) what port your card is set to. Also, do you happen to remember which driver you where using. I'm currently using the Oak one which has always worked for me in the past. Is there any bit of information I can give you? pan069 wrote: @appiah4 Thanks for the info, much appreciated. Ah, OK. You mean these? I already tried those. These appear to be for a PnP version of the card and the setup.exe is for Windows. The only DOS related bits on there appear for audio settings of a PnP version of this card. Oh I see, I had completely forgotten this case. We used to "solve" this sometimes by connecting the cable the other way around, plugging the furthest connector to the furthest device, but of course it's not always applicable. The two connectors close to each other need to reach the IO card and 1 device for this to work.